Exclusive to Aqua Vitae, we are the only Day Spa in Port Macquarie to feature these unique hydrotherapy spa baths that massage the higher cervical vertebrae of the spine and neck, offering a truly therapeutic spa experience from head to toe. The spa baths work via special above-water neck and shoulder jets that offer a complete neck and shoulder massage. Combined this with hydrotherapy massage back, thigh and calf jets, our spas offer a therapeutic full body massage. The strength of the jets can be adjusted from soft to more intense massaging - from neck to toe – depending on whether you desire a gentle pamper or full therapeutic massage. Deep seating ensures your body is fully submerged, while enhanced hydrotherapy with molded headrests incorporates higher neck massage. Pure Bliss! Our private hydrotherapy spas are located side by side in a a private room, making them the perfect way relax whilst enjoying the company of your friend or partner. 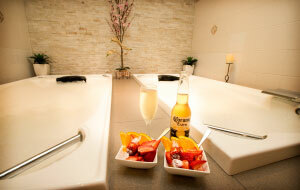 Whilst in the hydrotherapy spas, enjoy your choice of complimentary beverage with fresh fruit and premium chocolate. Each spa is sanitised after use and filled with fresh water for your visit, we do not use chlorine or any other nasty chemicals in your water. A damaged gut can also make absorbing magnesium and other minerals through the digestive system more difficult, so magnesium baths are a great solution. You will relax in our candlelit hydrotherapy spa with added Aromatherapy Oils to soothe your senses and ease your mind. All while you enjoy fine wine, chocolates and seasonal fruit. Enjoy your soothing hydrotherapy spa with your choice of beverage such as champagne, or juice with a bowl of fresh seasonal fruit and a delicious lindt chocolate. Lay back and let the jets massage your tired muscles, releasing the tension and soothing your soul.